Condo at Sanibel Harbour - Resort Harbour Testimonials. Top notch, printed our boarding passes, very congenial. We worked with Kara. We were delighted all around. Everything was so CLEAN....location of property is excellent as far as exploring Sanibel Island, Captiva, Fort Myers, Fort Myers Beach, etc. Also good location for day trip to Siesta Key/Treasure Island., all of which we did. We hope to return again. Our stay was wonderful and the condo exceeded our expectations, just beautiful! 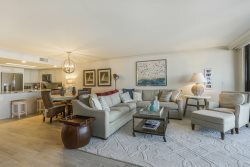 This condo was just renovated and it's awesome, has everything you need for a relaxing, fun stay. We will be back for sure! We have vacationed at Sanibel Harbour for years. It is a lovely place to relax, unwind and enjoy all the property and Southern Florida has to offer. The unit was updated, well appointed, clean and very comfortable. The views from the porch were beautiful. My kids loved the pool. We thought we would use the Marriott pool every day but they loved the pool at the condo more. We even had beach chairs to take to the beautiful area beaches. Fantastic family visit! We loved our stay in this condo. It was beautifully decorated and very comfortable. This was the fourth year we have stayed in condos in Bay View Tower and this was our favorite by far. We have already made plans to return next year. The location, condo, and staff make this a perfect vacation spot. Beautiful place, beautiful location, relaxing, enjoyable - just great! My only complaint was the beds were needed to be replaced. 713 is a beautiful condo, we really loved the location by San Carlos Bay, and close to Sanibel island. The swimming pool was perfect and a super location just yards from the small beach. We were gifted many great sunsets out over Sanibel and would run down to the pool area to take photographs. Definitely on the return and stay again list. Great Spring Break stay! Great property and very relaxing week! We had a great stay! Perfect location and the condo was excellent! Team members were incredibly responsive and efficient. Overall, amazing! We have been coming for years and each time we do are impressed with the units themselves, the views, wonderful staff and the overall friendliness of everyone with whom we come into contact. Can't say enough positive things about our experience at Bayview Tower! This place was by far the best Airbnb property I've stayed at yet. Super cozy, warm and very good location in a quiet friendly neighborhood. Highly Recommended!! !